Now that W goes to preschool a few mornings a week, I like to continue his learning at home. When I was teaching pre-K, I was all about making sure learning was fun for them. Everyone learns better when they’re having fun and I’ve learned that the little ones have a lot of fun when learning involves food! So when W started showing an interest in Fruit Loops, I knew there was learning to be done while we did a bit of snacking! Cereal sorting is an easy activity to explore colors which goes great with learning about rainbows! Taking everyday items and turning them into a learning experience is pretty easy. It’s a great way to keep the kids busy without having to do a lot of planning! 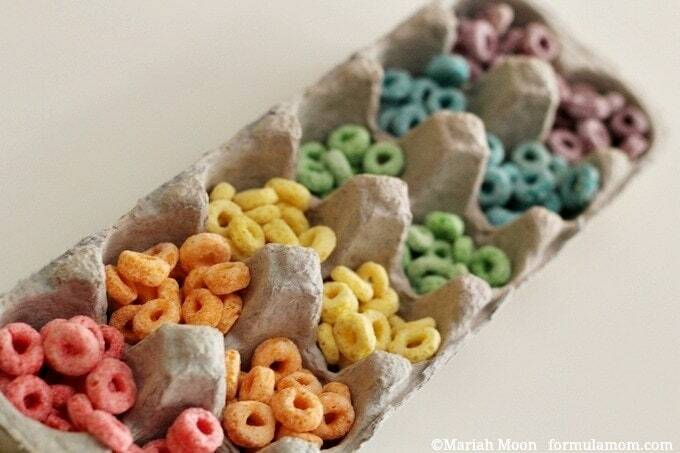 Fill bowl with Fruit Loops. Have child sort colors into each space in the egg carton. 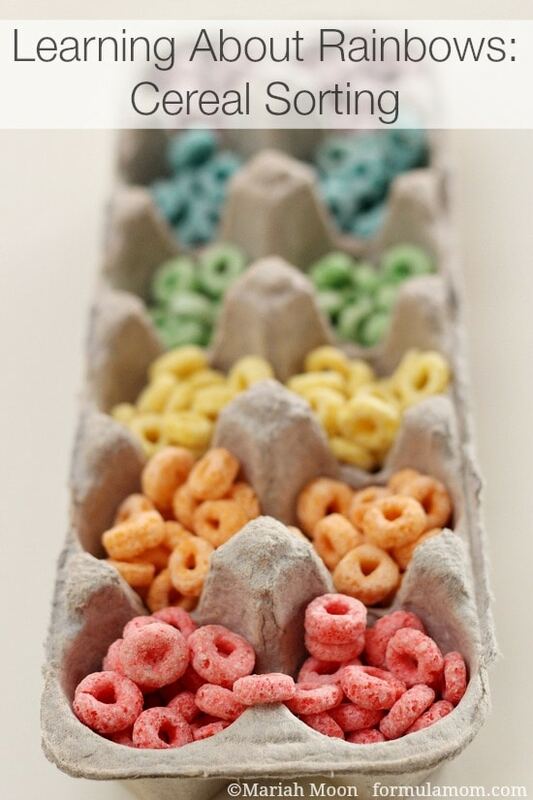 For younger children, place a Fruit Loop in each space and have them fill with the matching color. This was an easy activity for us to do together. And it worked out great because we used the sorted cereal to make our Rainbow Craft for St. Patrick’s Day. It was so much easier than digging through a big bowl of cereal for the colors we needed. 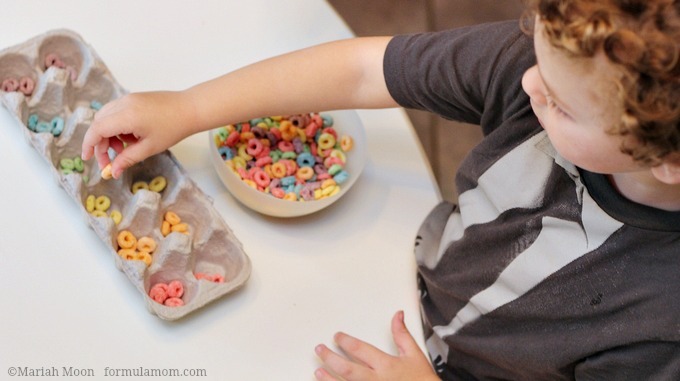 So if you’re planning on making anything where you need the Fruit Loops sorted, put your little learner to work! 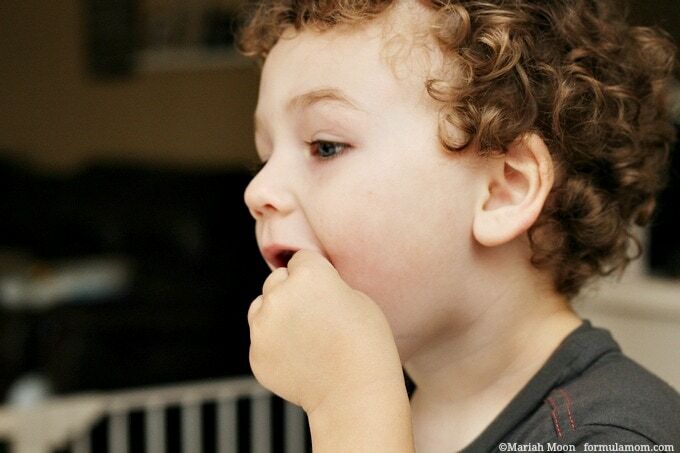 But make sure you have some extra cereal on hand because cereal is popular with those little learners too! It makes a tasty snack! And once you’ve talked about rainbow colors and sorted the cereal by color, there are many more opportunities for learning. You can work on patterning with the different colors. You can practice counting to see which color has the most pieces of cereal in the egg carton. You can even mix the cereal up and sort it all over again! It’s an easy way to have fun and learn at the same time. And it’s also good motor skill practice for younger kids! W loves sorting of any kind so this was a hit with him! What is your favorite way to use cereal besides eating it?